Lumbar spinal stenosis sitting-related pain is not common, as most patients find considerable relief while seated. This is because the seated posture increases the size of the lumbar spinal canal, helping to minimize neurological compression suffered therein. However, some causes of stenosis are exacerbated by sitting. We correspond with many patients who have been terribly misled by their doctors after reporting how sitting makes their spinal stenosis worse. Many of these patients are placed back into the diagnostic phase and are subsequently prescribed treatment for coincidental conditions that may exist in the lumbar spine. We estimate that only about one half of patients who report sitting-related discomfort with lumbar stenosis are correctly diagnosed and treated. This essay delves into the reasons why a lumbar spinal stenosis patient might suffer from pain when seated. We will provide possible answers to help patients to better navigate the diagnostic and treatment arenas, but also to inform many doctors of the iatrogenic mistakes they are making in clinical practice on a daily basis. Typically, lumbar spinal stenosis patients will feel relief when seated, since the position helps to widen the lower spinal canal and reduce painful pressure on compressed nerve tissues. While standing and walking can produce pain, tingling, numbness and weakness in the buttocks and legs, sitting usually helps patients to relax and feel better. However, despite the logic that a wider lumbar canal should produce pain relief, many patients suffer escalated symptoms when seated, especially for an extended length of time. Some patients display similar symptoms to their usual lumbar stenosis expressions. This includes the sore, weak feeling in the lower body and possibly the experience of worse issues, such as sexual dysfunction, incontinence or muscular deficits in the legs or feet, such as during foot dorsiflexion. Often, localized pain in the lumbar region is aggravated from long periods of sitting, which is not experienced during extended timeframes of standing or activity. Other patients might suffer symptoms that exist above the lumbar spine, including middle or upper back pain, neck pain or deficits in the muscular functionality in the arms. Some patients will suffer neurological tingling or numbness in the upper torso or arms in lieu of, or in addition to, pain. 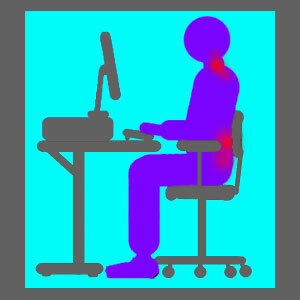 These symptoms might be demonstrated in other positions as well, but are definitively exacerbated by seated posture. The first scenario involves patients who definitely suffer from symptomatic lumbar stenosis and demonstrate all the typical symptomatic expressions of the condition, including exacerbated pain while standing or straightening the spine. However, these patients also demonstrate particular structural issues that might cause or contribute to the stenosis, but also become aggravated when the spine is bent for an extended timeframe, as well. This usually points to intervertebral herniation or ligamentous hypertrophy as contributors to the problem, since some of these conditions are known to intensify when the patient sits. Many lumbar herniated disc patients feel that seated postures cause the bulging portion of the disc to place increased pressure on nerves. We have seen evidence of this during open MRI evaluations for many disc pain suffers. Patients with lumbar spondylolisthesis might suffer increased vertebral slippage when seated, especially when the cause is degenerative spondylosis. This can occur with both anterolisthesis and retrolisthesis patients. We also occasionally see other lower back structural issues contributing to the sitting-related pain, even though they are not directly causative for the stenosis. These issues include scoliosis and hyper or hypolordosis. The second alternate possibility that can explain pain while sitting in lumbar stenosis patients is the additional presence of stenosis in the cervical (usually) or thoracic (very rarely) spinal regions. This is particularly true when patients also demonstrate symptoms above the level of lumbar stenosis. Patients who sit often, or for long periods of time, can exacerbate the compression suffered during cervical spinal stenosis. This is a common scenario when patients also do not maintain ergonomic seated posture, causing the head to lean forwards or backwards when seated. These circumstances can further decrease the patency of the cervical spinal canal, creating additional symptoms even while the lumbar stenosis expressions decrease. This can be very puzzling for the physician if the cervical stenosis has not yet been discovered and the patient does not demonstrate upper body symptomology, as well. Finally, mindbody causation can create positional-related pain even when no structural explanation exists. Mindbody pain syndromes are epidemic occurrences in modern society and can co-exist with purely-anatomical problems, such as lumbar spinal stenosis. In fact, the diagnosis of stenosis might actually be responsible for enacting the mindbody symptoms due to the power of the nocebo effect. Many lumbar stenosis patients are not accurately or completely diagnosed They might have the usual age and activity-related arthritic changes that create symptomatic versions of lumbar stenosis, but they also demonstrate other pathological conditions that account for their seated-related pain. These conditions have yet to be discovered during diagnostic evaluation and are therefore not being treated adequately or at all. 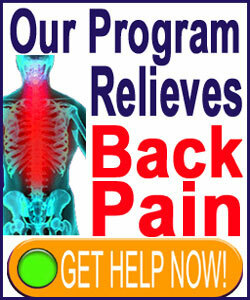 Unfortunately, we see this scenario happen constantly in the letters you send us here at The Cure Back Pain Network. It is our hope that physicians who read this essay will keep this in mind as they perform diagnostic evaluations of lumbar stenosis in order to improve patient comfort and markedly optimize treatment outcomes. Some lumbar stenosis patients also suffer from additional lower back conditions that might create sitting-related symptomology. As noted above, these can range from scoliosis to lordosis to intervertebral disc abnormalities at the same levels of the stenosis or nearby, often in levels just above the lumbar canal impingement, near the thoracolumbar juncture. Other patients might demonstrate areas of focal cervical or thoracic stenosis that might explain their seated pain. Sometimes, these cervical stenosis conditions are just developing and are therefore only creating limited or positional-dependent pain. Most have not yet been diagnosed. Some patients might be suffering the effects of psychological pain syndromes, in additional to structural spinal stenosis. We see many mindbody pain syndromes that can create pain which might be related to virtually any trigger mechanism, including sitting. These conditions will never respond to traditional medical care, so knowledge therapy should be implemented to resolve these issues in addition to the traditional care rendered to cure the structural lumbar stenosis problems. In order to best evaluate patients with lumbar stenosis and sitting-related pain, each should receive comprehensive full spinal canal imaging to check for areas of additional stenotic blockages. Each should also be treated by a physician who is well versed in mindbody medicine if no additional stenosis is located, since the chances of suffering from a conditioned-response pain syndrome are likely, especially in the absence of other definitive lumbar pathologies.